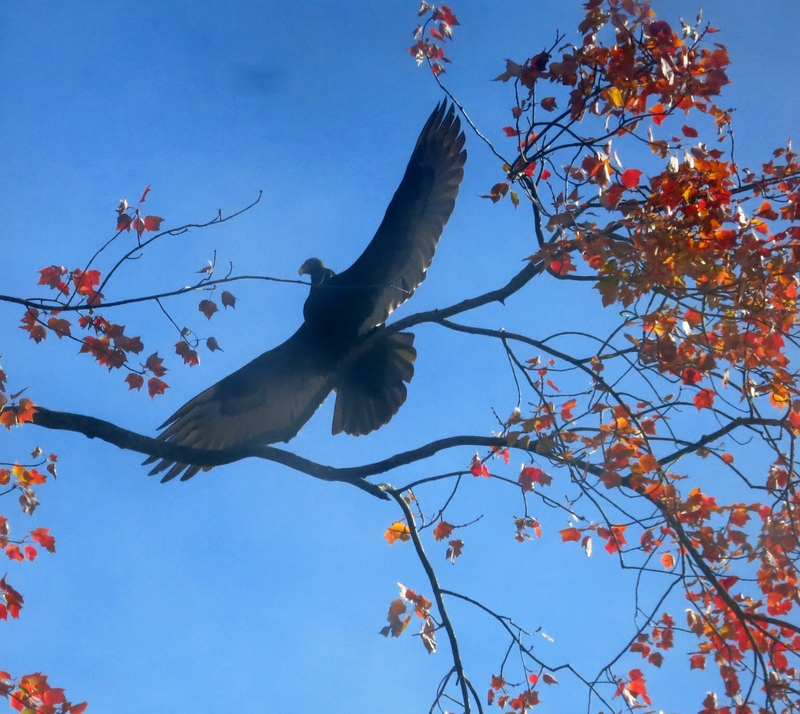 When my old dog, Indie, would see a Vulture, she would bark and chase it away. 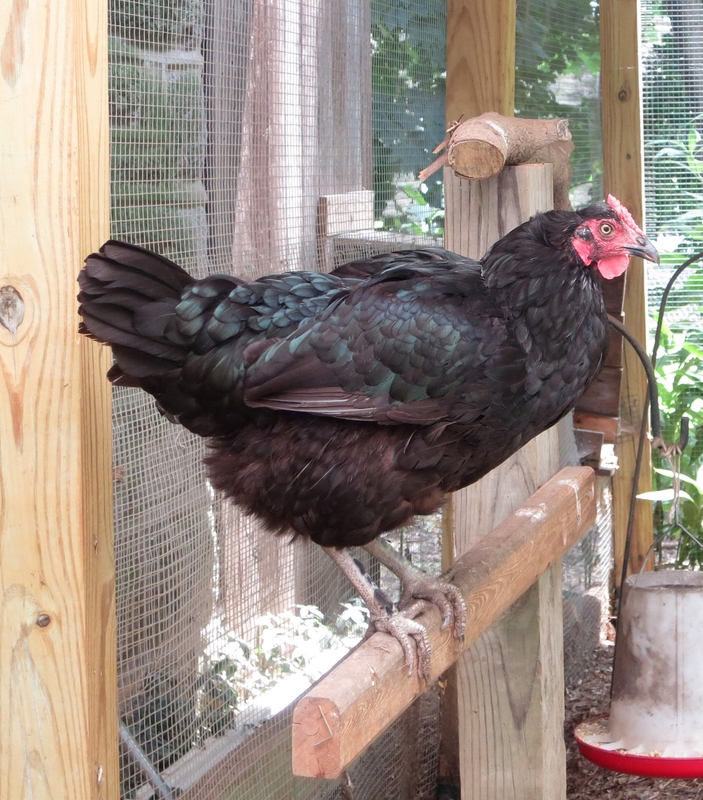 If you called, “Buzzard!” she would come to alert and begin running and looking to the sky. It was her job to keep the land free of the buzzards…not sure why. 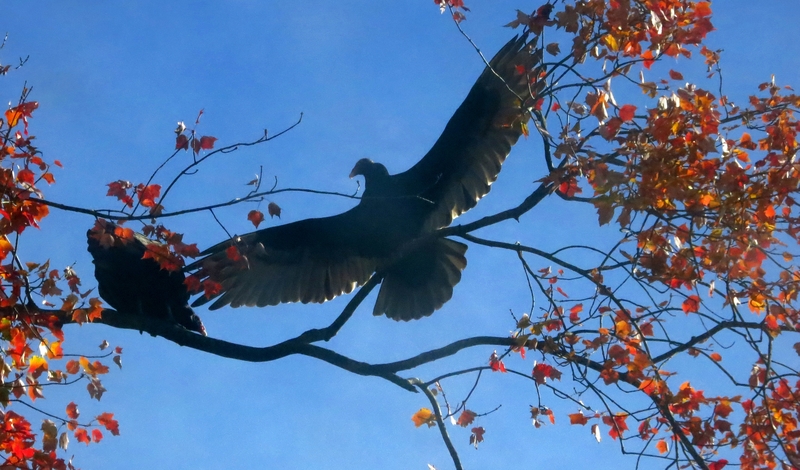 While I was trying to complete another blog post, I saw this from my window…buzzards! First one sunning, then another came along and chased away the first to sun itself. 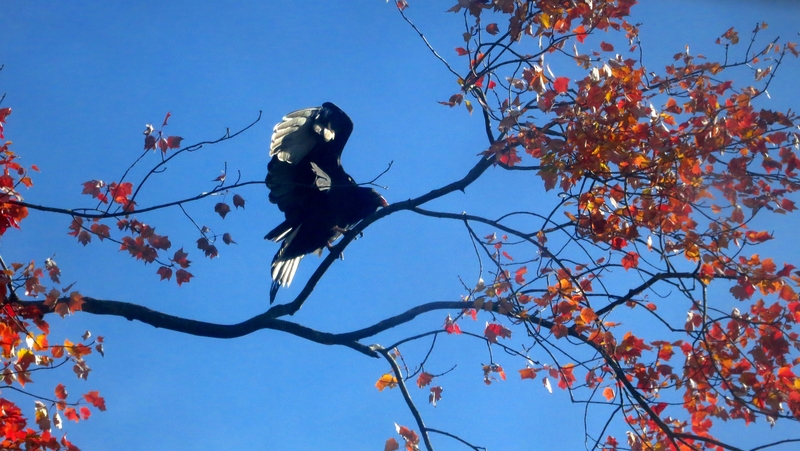 I’m thinking that this may be a black vulture vs. the turkey vulture. Not sure. The images were taken through a dirty window, unfortunately. November 4, 2013 around noon on a sunny day in the low 40’s. I’ve been stalking these birds for over a month; trying to photograph and to identify them. I recognize their voice and I, often, get to the pond just to see them fly into the willow beyond my camera’s range. We were thinking that they were Tricolored Heron (Egretta tricolor). It is smaller than the great blue heron. It has yellow feet and legs, dark body with white on its belly. After today’s sightings, I was quite sure; though, our location seems to be just a bit beyond their range. In researching this bird, I discovered Ebird.org. The site describes itself as a global tool for birders. I wouldn’t call myself a birder but the website is so amazing and useful that I had to sign up and report my sighting. RECENT (July 2, 9:30 pm) UPDATE: Please, note a comment from an ebird.org member, Nick, who helps me to identify this bird more accurately. I am, so, impressed that I’ve, already, received feedback from Ebird and with Nick’s responsiveness. 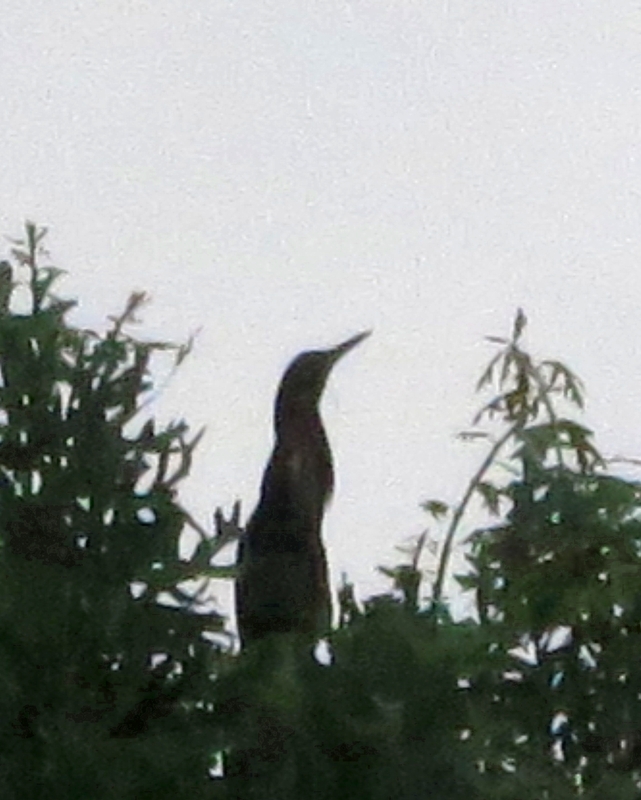 He recognizes this bird as a Green Heron. That is very possible. When I look at the ebird range map, it seems much more likely in fact. It is time to start remembering to bring my binoculars with me so that I can attempt to verify the coloring and markings. My distant vision is not so wonderful nor is the range of my camera. I need bigger pockets! Early this morning, I saw one of the birds fly into the top of the white oak in front of the greenhouse. Then, early this afternoon, I thought I would let Indie go down for a swim in the pond. I brought my sickle to cut down some of the vegetation around the firepit and I brought my camera, just in case. Sure enough, I heard that familiar bird call. I couldn’t resist and had to go down to the pond to try again. I’m so glad I did. I squatted at the pond’s widening edge (lots of rain these days!) looking across the pond to where they usually show themselves. I squatted long enough for my feet to fall asleep and my socks to get wet and for for the birds to show themselves. After some time passed, they seemed to become quite comfortable to go about their business. I was surprised to see three! They sing for a very long time! I’ve read that at the beginning of the mating season, the male bird goes to the treetop and sings and sings and sings to demonstrate endurance. I have longer sound recordings but…you get the idea! The brown thrasher is in the family of Mimidae which includes birds such as the Catbird and the Mockingbird. 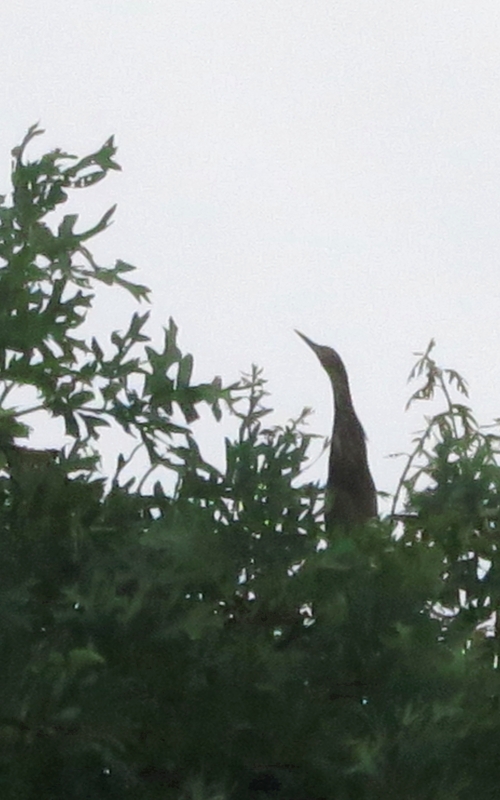 I do not have a good close up or still shot of the bird but could see the brown color, shape, long tail, and hear it’s continuous and varied song. There are many good descriptions that I’ve found on the internet. I like this description of the brown thrasher’s song. The writer shares a “picture” of the bird encouraging farmers as they plant seeds in the field. The go-to Cornell Lab of Ornithology is, also, a good reference for a description of the brown thrasher.